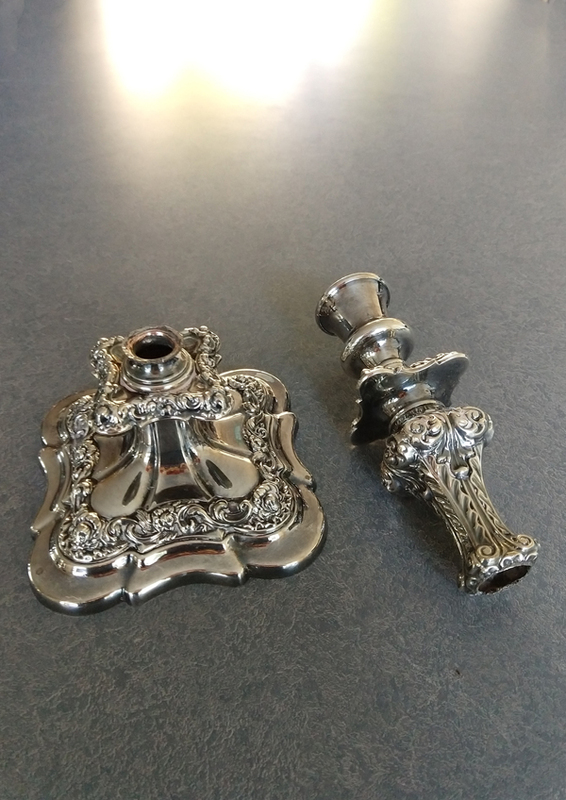 Many older 19th and 20th century candlesticks are silver plate on white metal. White metal is a cast alloy that may include antimony, tin, lead, cadmium, bismuth, or zinc. It is usually thin, brittle, and weak. The metal thickness is often insubstantial for the heavy weight of the candlesticks and candelabra arms. This is why white metal candlesticks and candelabra break. The broken candlestick above was obviously repaired before and the white metal was very thin where it broke again. Repairing white metal without adding reinforcement is just asking for trouble. The most challenging aspect of repairing white metal is that the metal melts at close to the same temperature as the solder. Sometimes the silver plating even floats on top of the metal and wrinkles like a skin. There is no way to predict how the white metal will behave because there is not one recipe for white metal. They are all different and I don’t know how it will behave until I start working on the object. To strengthen the repair of A white metal candlestick, I may take some Extra steps. The brass tubing will hold the candlestick stem more securely adding core strength. Sometimes I set the brass tubing in plaster to strengthen the upright candlestick before soldering. My third repair reinforcement option is to add sterling silver sheet or wire. This polishes up very nicely while concealing and reinforcing the white metal repair. Adding a custom made round ring of sterling silver wire at the break helps conceal the repair work and strengthen the repair. The silver wire polishes up nicely. However, a repair is never perfect. For example, the low temperature solder contains silver, but it is not silver solder. The solder is not the exact same color as the silver plate. Ideally the solder melts and solders the white metal, but this step is never easy to do. Sometimes the white metal starts to melt before the solder. An additional concern is that the silver wire may change the designed profile of the candlestick just a little. Most people will not notice but the addition of the silver ring often improves the appearance of the repair. Some candlesticks already have a “ring” as part of the design. In this example the sterling silver wire at the repair (at red arrow) is just a little larger than the original design. The sterling wire polishes up nicely, but the solder is still visible under close inspection. It is the best that can be done. NEVER USE GLUE. Do not use glue on white metal. Glue (no matter what kind) is not strong enough no matter what the package says. The only thing good about glue is the advertising. Removing glue is time consuming and can affect the success of soldering because it gets into the pores of the metal. 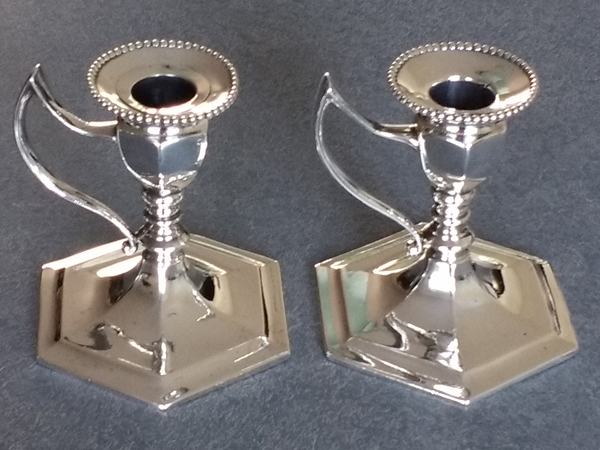 These white metal silver plate candlesticks arrived with the candle cups broken off. After studying it closely, I saw that it had been repaired before. White metal is very thin and melts at very close to the same temperature as the solder. Look closely at the right photo. The left candle cup has a silver ring around the center. To conceal the repair and add additional strength, I created a sterling silver washer formed to fit inside the curved candle cup. After polishing, they look great!